Our last "goodbye" to Bill McGlone, a good friend and the inspiration for our "Expedition '98." What happens when we pass away? Will our lives have amounted to anything great or lasting? These are thoughts that lie unanswered in my mind before I became involved with the research of Bill McGlone. But they don't anymore. I met Bill in his Colorado home last June. His name was commonplace with anyone interested in the question of what survives death. For Bill, this topic was a subject that filled his life, and a few well written books. 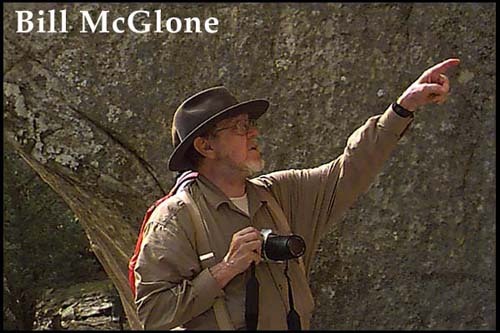 Bill McGlone was one of the most comprehensive researchers and authors on epigraphy, the study of ancient rock carving, bar none. For the most part, the people in the small cattle town were unaware of their special resident. Bill was an unassuming and quiet man. He had served his country with the development camouflage techniques for Navy ships, as well as a host of other innovations that go unblazoned on the pages of history. When he retired, Bill brought his high intellect and engineering skills to a town that he often described as the "most friendly and livable place in America," La Junta, Colorado. On that summer day in 1998, when I checked into the motel in La Junta, I mentioned Bill's name. To my surprise, the owners of the motel had no knowledge of Bill, nor the rich history that he had discovered on the rocks and canyons surrounding their town. Had they known what this gentle, bearded man had discovered right in their own backyards, they probably would have named their motel in his honor. For such was the significance of his discovery. Bill had written to me, describing an enormous number of petroglyphs that he had been studying. Some of these rock carvings appeared to be much more than mere doodles in stone, or the graffiti of Native Americans. He saw writing, with letters and repeated symbols. Over the years, Bill had attempted to identify these letters and, shortly before his death, January 30th, 1999, he had made a reasonable argument that some of the petroglyphs were from an Arabic alphabet, called Thamudic, which would have been made by Turkish sailors around 500 BC. It was this claim that prompted Viewzone's 1998 Expedition, still posted in the magazine's archives. Bill was a stickler for adhering to the scientific method. He never would put the cart before the horse and always insisted that his findings needed outside verification and further research. Nevertheless, Bill McGlone's exploration and documentation of the petroglyphs of La Junta should have been convincing enough to proclaim various sites as national parks. The rocks are still there. I think about them sometimes, desolate and weathered. And now that Bill is gone, I long to see them again, like the familiar face of a friend. On a more peronal note, Bill's second passion was good food. His days as an engineer allowed him to travel to just about every corner of America. He once told me that he had visited and sampled the food of every restaurant on the official list of the "best one hundred places to eat" in America. His specialties were ribs and barbecue. Bill and I frequented "The Bean" and other spicy haunts in his home town and, at each location, Bill would proclaim, "La Junta has the best food I have ever tasted." This was a proclamation that I had no trouble accepting. What happens when we pass away? Will our lives have amounted to anything great or lasting? Bill found answers to these profound questions in the messages left etched on the canyon walls by ancient inhabitants. To him, and anyone else that shared his interests, these rocks spoke of past lives filled with magic and spirit. To Bill McGlone, these were living records, defying eons of time, shouting, "Look. I was here." Indeed, Bill McGlone has left his mark on me, as I am sure that his work will continue to leave its mark on future generations as they study the mysteries of La Junta's Picketwire Canyon. For me, the rocks will always speak in Bill's gentle voice, "Look. I am still here."